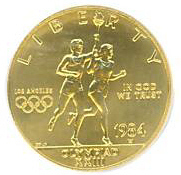 The 1984 Olympic Gold Commemorative was the first U.S. gold coin issued in more than 50 years, and was the first U.S. Coin to bear the W mint mark for West Point Mint. It was designed by John Mercanti from a concept by James Peed and was also minted at the Philadelphia, Denver and San Fransisco Mints respectively. 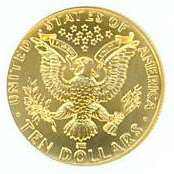 The coin had a denomination of $10 and was issued in a proof and business strike version alike. The Business strikes where minted at the West Point Mint while the Proofs where struck at the others. "The 1984 Summer Olympics, officially known as the Games of the XXIII Olympiad, was an international multi-sport event held in Los Angeles, California, United States in 1984. Los Angeles was selected as the host of the Games on May 18, 1978 on the 80th IOC session at Athens, Greece, without a vote, because it was the only city that submitted a bid to host the 1984 Summer Olympics." You skipped the Wilson Dollar of 1920. I'll get back to my duties with commems tomorrow.